Flowers Foods, Inc. is voluntarily recalling Swiss Rolls and Captain John Derst's Old Fashioned Bread, sold under the brand names Mrs. Freshley's disturbed at Food Lion, H-E-B, Baker's Treat, Market Square, and Great Value nationwide. 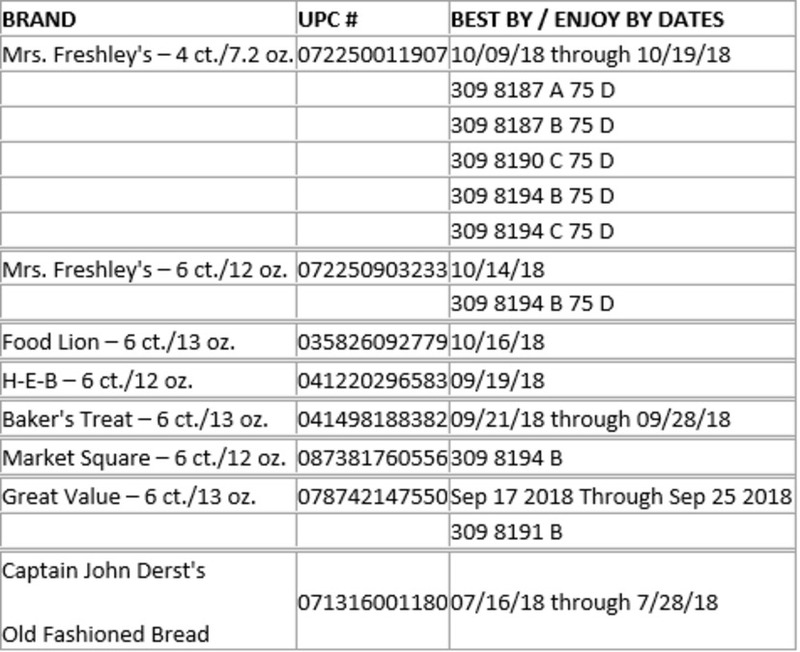 Products distributed in Alabama, Florida, Georgia, North Carolina, and South Carolina, have been recalled due to the potential presence of Salmonella in an ingredient, whey powder. The ingredient recall was called by a third-party whey powder manufacturer and supplier. There are no illnesses that have been reported in connection with the recalled items. As a precautionary measure, the company recommends consumers should not consume these products. Affected product should be thrown away or may be returned to the place of purchase for a full refund. Consumers with questions may call Flowers' Consumer Relations Center at 1-866-245-8921. The center is open Monday through Friday from 8:00 a.m. to 5:00 p.m. Eastern. Consumers also may contact the center via e-mail by visiting www.flowersfoods.com/contact/consumers .